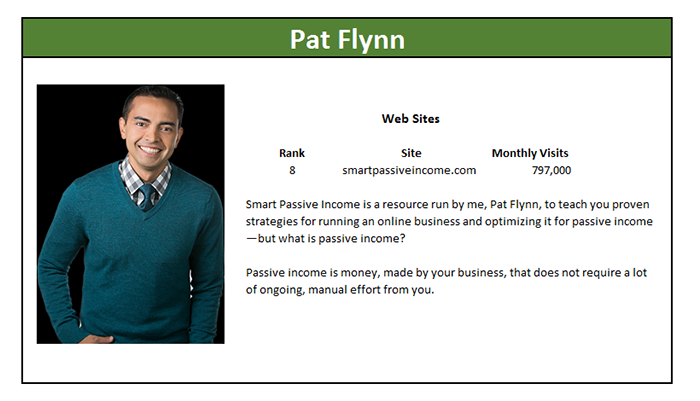 Marketing Master Profile for Pat Flynn. What’s This? Building online businesses that take advantage of systems of automation that allow transactions, cash flow, and growth to happen without requiring a real-time presence. He’s ranked #8 of the Top 15 and gets about 800,0000 visits a month. Flynn’s site is a little less reliant than the average Top 15 Master on SEO. He gets 32% of his traffic from SEO rather than the 44% that is average. He makes up for it with above average traffic from Direct, Referral, and Email. Flynn’s content quality scores are above the averages. His visitors spend a full minute longer than the average on his site and consume 2.49 pages instead of the average of 1.84. His bounce rate of 51% is below the 63% rate for the Top 15 average. In fact, only one of the Top 15 has a better bounce rate, and that would be Amy Porterfield. Looking at the SEO scores, I see a couple of things. First, Flynn could use a lot more backlinks to get to the average. Second, he does a good job of keyword targeting (good traffic per keyword), but could use more keywords. It may be that he is not writing about as broad a collection of topics as some of the other Top 15 players. The SmartPassiveIncome site pulls in a slightly below average traffic from Social Media. The mix is low for Facebook and LinkedIn but above average for YouTube and Twitter. Congratulations Pat Flynn, and welcome to the Top 15 Marketing Masters of the Digital World! If you want to understand how to be a World-Class Marketer, you’ve got to study the Marketing Masters. We make that easy by compiling extensive research and presenting it to you in these Marketing Master Profiles. Periodically, we’ll also do cross-sectional research against the data to see what secrets it reveals. What are the common threads among Marketing Masters? What are key differences between Masters and the rest of the pack?